How I use my Media? Overall I notice that I use my phone a lot. I would not be able to get through my day without my phone. I talk to my family a lot, as well as use Snapchat. One thing they I don’t do a lot is watch television. The most I watch television is when I watch Netflix. That is usually on a weekend, or if I don’t have any morning classes. I usually binge watch it, at least for an hour or more. I never play games; I don’t really see the point in them unless you are a boy, or if you are a complete game hawk. I feel like I don’t really need to watch television or play games, it isn’t a necessity in my life like some other people. While others are watching Empire, I prefer to be in my room on social networks. My most preferable use of media is talking on the phone. If something was to happen, I would probably go crazy. I’m not living at home right now, so I want to keep in contact with my family. I want to know what they are doing on a daily basis. I talk to my mother at least 5-10 times a day. We talk in the morning, a couple of times in the afternoon, and at night. I also like talking on the phone the best, because it is better than texting. Your messages are conveyed better, you can understand the person you are communicating with better. It’s almost like you are in person. I love FaceTime because it allows you to see the people and hear their voice. That is a win, win situation for me. When I talk on the phone to my family and my friends, my emotional need seems to be fulfilled. It gives me a loving feeling when I have conversations with the people who are dearest to me. Love is what I need. My interest need is fulfilled also, because I am never bored with all of the social networks. Social networks are not necessarily fun, but they are addicting. That is where you find out who is doing what. You can be on there for hours because it’s like a constant update of someone’s life. Let’s be honest, we as a human race are inquisitive, so we indulge in essentially stalking our followers. 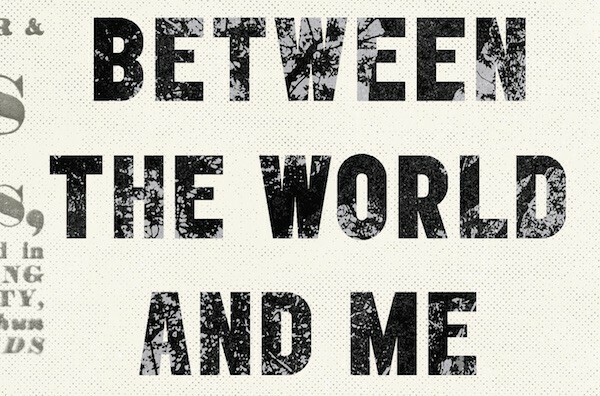 I don’t think I’m that addicted, but sometimes I can’t go a day without getting on a social network. It keeps me occupied.4. I gave up Netflix and Snapchat for a week. Snapcaht is an app that allows you to make 10 second videos, take pictures, direct message your followers, and even send money through something called SnapPay. Netflix is an app which holds many television shows as well as movies. You pay for this app monthly and you get too enjoy new movies and classic as much as you like. I chose to give these two mediums up because I use Snapchat a lot and when I watch television, I watch too much so essentially I am glued to the shows. These two things are apps that I have become accustomed to but, they are things I don’t need. It was kind of hard to give up Snapchat, but not Netflix. I use Snapchat every second of the day, but Netflix wasn’t so bad. I was so tempted to get on Snpachat and watch videos and make videos, but I resisted. I didn’t interact of that social media app for the whole two days. The days were during the week, so I guess I didn’t really care because I was busy with classes and schoolwork. As I stated before I never really watch television on the weekdays, so I wasn’t bothered by that. Also if you keep yourself engaged during the day, you will have no need to want to check social networks. This didn’t affect my interpersonal relationship with other because those who I am really close with I will always keep in contact with via text or telephone. Interacting with my peers on a daily basis became better. I was able to communicate with them better because I wasn’t so focused on what was going on, on my phone. I actually listened to them and we have more insightful conversation. I even did things like yoga. It honestly made me more active for those couple of days. I had to be on the go to keep myself occupied. Moving forward, I notice that I use my phone a whole lot, but I probably won’t stop doing it. It made me aware of how much I rely on my phone to keep me occupied, give me entertainment, and such but I’m going to keep doing it. I’ll put my phone down more when I talk to my friends because I realize how rude that can be to seem like I am not listening. In conclusion, I won’t change my ways, it was a fun experiment though. On a day to day basis I use my phone a lot. I am in school, and I don’t work so I have no income. Therefore I am still on my family plan. I don’t contribute to the bill finically, but I do contribute the cost. In an average month my family spends about $488.00 on our phone bill. There are five of us on the bill, so I consider that to be pretty cheap. This means that in between the five of us, we contribute about $97.60 to the bill. That is very close to $100.00. We dint buy albums on iTunes or buy the games that cost money in the App Store, but if we do then the bill will be an extra 30 dollars or so. If I was to be on a phone plan by myself, I would probably spend on average 100-120 dollars a month. We already contribute about 97 dollars each, but then I would have to think about taxes and things like that. If I was on the bill by myself I would probably also buy whatever I wanted to, if I could afford it. Being a student, I am glad I am on a family plane because $100.00 can add up. Sometimes I take my phone service for granted because I know I will always have it. Instead of using my phone so much, I could stop and it can bring the bill down. Go check out my group member’s blogs you guys! The data collected represents a five-student group’s media intake over the course of a week. Students were asked to record the time they spent on a mobile device, computer, watching TV, listening to music through MP3s or an iPod, engaging in social media, tuning into the radio, gaming, or reading print media. After logging the data for a week, students were able to gain a better understanding of the way they engaged with technology. Cell phone use topped media consumption in the five-person group with 10,151 minutes. The data suggests that the accessibility to diverse forms of media through cellular phones as well as their portability make them a top form of technology. Televisions were the second most used at 8,760 minutes. The important distinction to make is that this category included means of consumption like Netflix and other internet-based forms of TV watching. Social media usage raked in 3,506 minutes. Computers followed with 2,715 minutes. One can presume that five years ago, the number of minutes one spent on a computer would be higher because the prominence of social media and cell phone apps had not reached their current level of popularity. Following computers, students reported listening to the radio 980 minutes. Print media—publications circulated in the form of physical editions— accounts for 468 minutes. Lastly, gaming saw a total of 238 minutes logged; the only male in the group logged those minutes. I was responsible for Role 2. 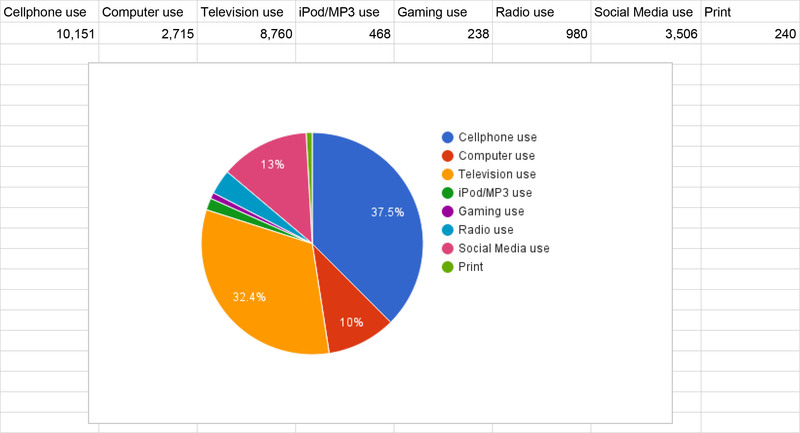 Below is a link to a spreadsheet of my group member’s media usage over a 5 day time span. You will see a spreadsheet, a pie chart(visualization tool) as well as my role, Role 2, my job was to create a tutorial on how to compose a pie chart. Week 7/8: What is the Digital Divide? The digital divide is defined as being without access to the benefits derived from Internet usage. It was predicted that African- Americans and other minorities would be the most deprived when it came to digital technology. Even though that was predicted, it appears that the gap has actually narrowed. For example it has become more possible for others to connect due to mobile devices and things such as that. Although the minorities have access to things like smart phones and laptops, they still felt as if they are being deprived of something, and that is the correct information. For instance, they receive news coverage that lacks diversity. As many people know, news only shows what will sell, but does not show much of what actually matters or is going on in the world. The only access they have are bogus reporters, stories on social media( Which are not credible), and other unestablished sources. It is obvious that even though the gap has became narrow, there is still a digital divide in the black community. I enjoy reading, but this book was not just reading for leisure; it was like a cultural awakening. When the text first began, I was confused as to the concept of “the black body.” As I read, it became clearer that “the black body” was a representation of African- American identity. As soon as the opportunity presented itself, I wanted to hear him speak, to hear him elaborate on this brilliant piece of work. I walked into Childers Hall, and into the second floor auditorium and sat down. The anticipation was taking me over. Soon he walked in, he was very calm and had a certain humbleness of himself. When he spoke about Howard, he spoke very highly, and of how many influential writers and thinkers attended our fine institution such as Toni Morrison and W.E.B Du Bois. He credit Howard University so much for his creation of this book. He discussed how he essentially lived in the library, he read so much and his experience was changed because of it. One thing I really liked was when he said he e “wouldn’t change being black for anything in the world.” That made me realize how much pride he had in his culture and his race. I thought that was so beautiful, because I see the same growth in myself. I always understood I was black, I always had pride; but now there is an overwhelming joy in the celebration of my own people. It is so important to be proud in our culture because like Coates said, “With all of the negative things imposed on us, we start to think of ourselves negatively.” That’s so true, we often deem ourselves not worthy, but we are so much more than what we think. We are so much more intelligent, more intellectual. 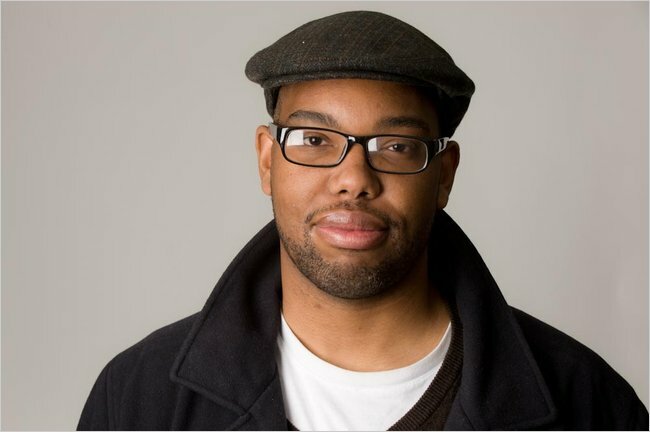 The last thing Coates said that struck me was “If white people knew what I knew, they would want to be black. “It was funny, but it was accurate. We com from struggle, but we always prevail. This book incorporates our tough world with such a rich culture, full of black kings and queens.